Can the sunrooms be used year-round? Yes! Our sunrooms are best enjoyed 365 days a year. Our glass, CONSERVAGLASS SELECT™, incorporates energy-efficient technology, so your sunroom will stay cool in the summer and warm in the winter! 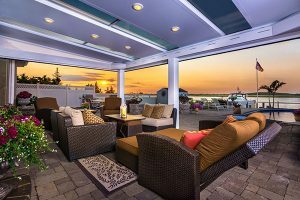 Can a patio enclosure/sunroom be built on an existing deck? Absolutely. Having an existing deck is the perfect foundation for a patio cover, patio enclosure, or sunroom! Does a sunroom add value to my home? A sunroom is considered a room addition, which will indeed add value to your home. A sunroom is a great investment for anyone looking to enjoy the outdoors inside! Will my sunroom be custom-designed for my home? Yes! Our Sunroom Specialist will provide an in-home consultation, where they survey your current home and layout. They will provide a custom design and quote in order to best suit your existing home structure. How long does it take to get a custom quote for a sunroom? A custom quote is carefully compiled and sent to you within one week of an in-home consultation. 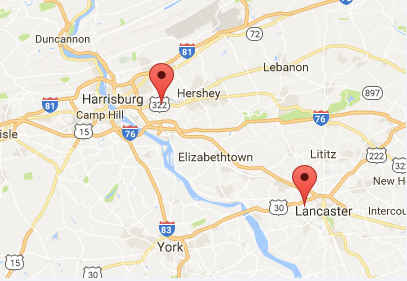 We service South Central Pennsylvania! This includes, but is not limited to, Dauphin, Lebanon, Lancaster, York, Perry, Cumberland, and Adams Counties. How long will an in-home consultation take? Depending on what type of structure you’re looking for, an in-home consultation can take anywhere from 1 – 2 hours. If I sell my home, will the warranty be transferred? Absolutely! Our Limited Lifetime Warranties are fully transferable to the next homeowner. How many years of experience does PAsunrooms have with installing sunrooms? PAsunrooms has ben serving Central PA continuously since 1987. We have over 30 years of experience with installing patio covers, patio enclosures, as well as all Four Seasons Sunrooms products! With PAsunrooms, you’re in good hands! But don’t take our word for it – check out what our happy customers have to say here. Do you repair sunroom glass? Yes! Our team is able to service and repair your sunroom glass effectively and efficiently. How much do sunrooms cost? There are many different variables to consider when discussing the price of a sunroom! Since all quotes are custom, we don’t have a specific pricing per product. If you’re interested in pricing for a sunroom, contact us today for a free in-home consultation. How much space do I need to build a sunroom? There is no required amount of space needed! From small conservatories to large family-sized sunrooms, our sunrooms can be any size to fit your lifestyle. Does my sunroom come with a warranty? Yes, of course! All sunrooms come with Lifetime Limited Glass Warranty, as well as additional warranties on vinyl, aluminum, and wood components and hardware. Will my sunroom look like a natural part of my home? Absolutely! Our design team will ensure that your sunroom will seamlessly blend into your current home design. How do I maintain and clean my sunroom glass? Our glass, CONSERVAGLASS SELECT™, is low maintenance due to its self-cleaning properties. The Stay-Clean Technology is engineered with several durable coatings that enable your glass to stay cleaner longer! And for the inside of your sunroom, a simple glass cleaner is the perfect solution to smudges and dust build-up. What type of building permits do I need to acquire before my sunroom construction starts? You don’t need to worry about applying for any building permits! PAsunrooms is a fully-licensed contractor and will take care of all permits and paperwork for you.